First made by the "Acrow" company these items are used for supporting mainly formwork in a vertical position but can be used raked and even horizontally. They consist of one steel tube sliding into another with a course screw and collar for adjustment. The have square steel plate on each end to distribute the loads. 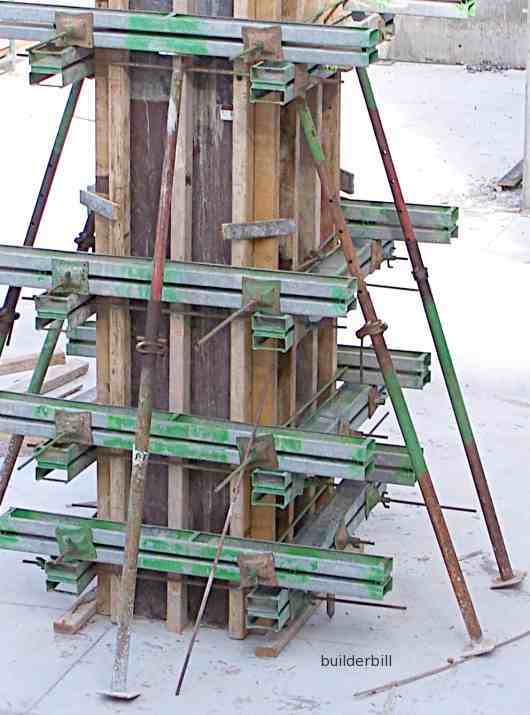 Above, a few adjustable steel Acrow type props being used to brace a column form. These props come in a range of sizes, and they all have a course adjustment by placing a steel pin in one of a series of holes. The fine adjustment is via a threaded end and collar. The threads a square cut and design for load bearing and easy cleaning. At the side here is a photo of a rather rusty Acrow prop's adjustment collar. The swivel bar is used to lift the prop when there is no load and usually when the lifting gets harder or when stripping the formwork then the collar usually gets belted loose with a hammer.